If you recall, The Rapid attempted its tax increase in 2010, which failed at the polls, so they tried again in 2011, and the tax increase passed by 136 votes. The tax increase was ostensibly to implement the Silver Line, which we have been critical from the start because of the impossibly absurd promises made by the The Rapid at the time. For instance, The Rapid promised that the Silver Line would attract 7,200 riders per day and increase the system’s overall ridership by 1,200 people per day (all in its first year of operation). But, as we pointed out previously, the Silver Line turned out to be barely faster than the existing buses that run virtually the same route (averaging just 22 miles per hour) and system-wide ridership started to decrease when the Silver Line entered service. It’s now been six years since The Rapid’s Silver Line tax increase, so we can take stock in what has happened since then. Well, it’s not good. The most recent monthly ridership data, available from the federal government’s National Transit Database, shows that The Silver Line is attracting fewer than 2,300 riders per day, a far cry from the 7,200 per day that The Rapid promised. But, even more spectacularly, ridership across the entire system has dropped below where it was in 2011, when the tax issue first passed. So not only has the Silver Line failed to attract new riders, the entire purpose of the tax hike seems to have failed. 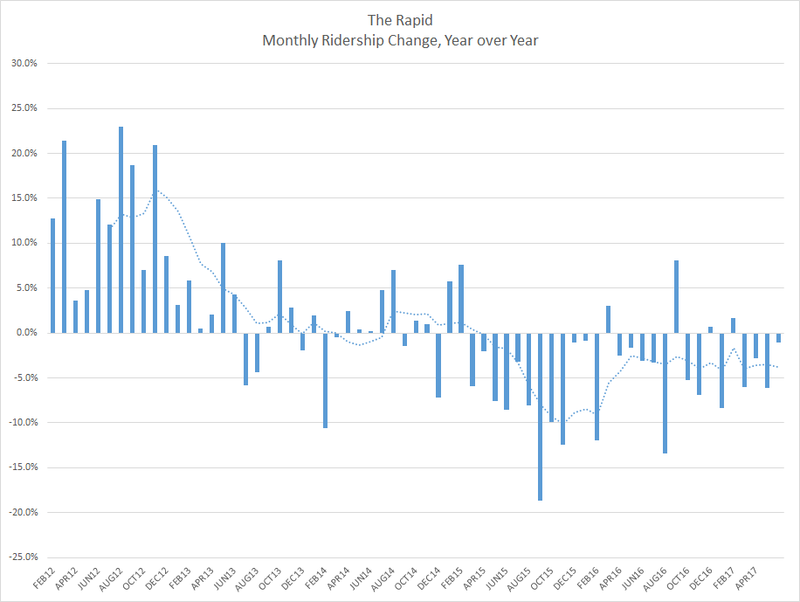 Indeed, the ridership decline has been steady for the last three years, with no end in sight. And now The Rapid wants a renewal of its 2011 tax increase so that it can build another Silver Line, called the Laker Line. This project, originally estimated to cost taxpayers $45 million, has exploded to over $71 million. All this for a new bus line that would simply duplicate the existing buses that run between GVSU in Allendale and downtown Grand Rapids. In other words, The Rapid wants to spend $71 million to add no new service at all. (And, as an aside, GVSU student ridership has been decreasing as well). We don’t need a renewal of the 2011 tax increase, we need a refund, and The Rapid has to start spending money on projects that aren’t a waste, like the Silver Line and proposed Laker Line. It seems as though The Rapid is planning for the past, not the future. July 17, 2017 in Latest Updates.